For 42 years, Hoffa's disappearance has spurred innumerable conspiracy theories and urban legends. Have we now solved the mystery once and for all? Robert W. Kelley/The LIFE Picture Collection/Getty ImagesJimmy Hoffa at the Teamster’s Union Convention in Florida. October 1957. 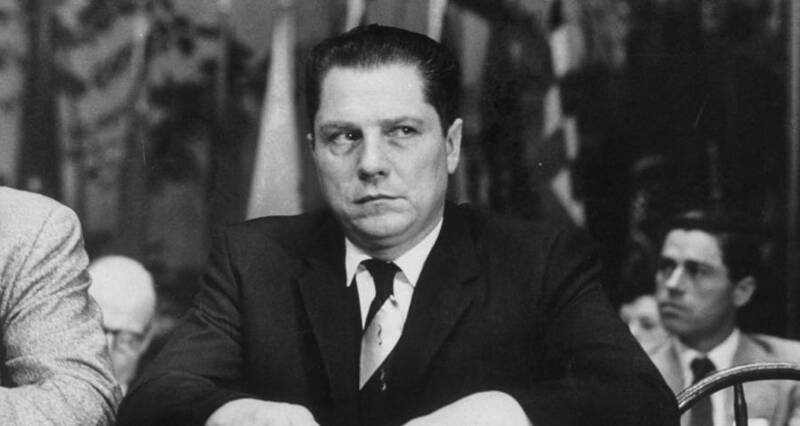 The mystery of what happened to union leader Jimmy Hoffa has baffled the public ever since his disappearance from a Michigan parking lot 42 years ago. Now, CBS Detroit reports that James Buccellato, a professor of criminology and criminal justice at Northern Arizona University, has a new theory that Hoffa was murdered at a home in Bloomfield Hills near where he disappeared on July 30, 1975. He believes that Hoffa was lured from the parking lot where he was to meet with mafia leaders and taken to a nearby property owned by mafia member Carlo Licata. Buccellato claims that Hoffa was then murdered at that property before he was transported to a nearby crematorium. These scenarios would account for the fact that Hoffa’s body was never recovered. However, long before Hoffa made headlines because of his mysterious disappearance, he did so for other reasons altogether. Hoffa was a Detroit labor union leader and activist who was well known for his involvement in the Teamsters Union as well as the criminal charges that he faced while president of the organization. These crimes originated from Hoffa’s involvement with organized crime, and consisted of improper use of union funds, and then attempting to bribe a grand juror when he was indicted for that first crime. Nevertheless, Hoffa’s criminal convictions, as well as the growing political power of his union, fueled his rise to prominence and fame. However, his connections with the mafia were what would ultimately bring him down. The FBI investigation of his disappearance failed to find his body, or to identify his killers, and the exact nature of his fate remained a mystery. But nature abhors a vacuum, and in the absence of evidence, conspiracy theories, urban legends, and rumors filled the public’s imagination. One famous theory claimed that Jimmy Hoffa was dismembered and that parts of his body were buried underneath Section 107 of the New York Giants’ stadium in New Jersey. This theory was disproven by the Mythbusters in 2010 when the TV show investigated the newly razed New York Giants’ stadium and found no evidence of a body. Others believed that Hoffa was buried in the foundation of Detroit’s Renaissance Center, which was being built around the time of Hoffa’s disappearance. Unlike these outlandish ideas, Buccellato’s theory seems much more plausible, albiet far less exciting. However, if his theory is correct, there would be little to no evidence available to prove it, as there would be no body to recover. This ensures that even if Buccellato is right, the mystery of Jimmy Hoffa’s disappearance will continue to endure. Next, read about new evidence that may have been uncovered in the mystery of what happened to infamous plane bandit D.B. Cooper. Then, see the recent study that claims to have finally identified Jack the Ripper.